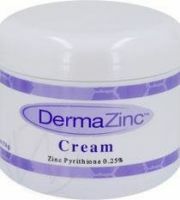 Pyrithione zinc cream that helps treat seborrheic dermatitis! More than just a moisturiser? Anti-inflammatory Lowers sebum production Anti-bacterial Can be oily if used heavily I've been using this for about 7 years now pretty much none stop. The active ingredient is the same stuff they've been putting into head and shoulders since the 1930's. Zinc Pyrithione is anti-seborrheic and I'm pretty sure this cream does over time affect sebum production and calm out breakouts. I say this because I began using it to treat seborheic dermatitis when I was about 21 but I was hesitant at first in case it blocked my pores. After a year or so of using this product I noticed that my acne had steadily declined to nothing. I wasn't using any other product at the time, although I did move to only washing my face Luke warm water (another factor that would likely cause a decline in sebum as I was not stripping away oil everyday). It's also anti-inflammatory so it reduces redness, there is also evidence to suggest it aids healing. It's not a miracle cream, don't put it on active cysts and wonder why it isn't shifting them. Use it as maintenance therapy after Roaccutane or Antibiotics if your acne is severe. I've learned over the years that in acne regimens less is often more. Don't over dry your skin. The other thing I've learn is that success is measured in months and years, not days and weeks. That fact might be of little comfort to a face full of acne but its very true.